Honolulu, Hawaii — The Maluhia-Leahi Hospital Foundation recently received an electric vehicle donation from Rachael Wong to support Leahi Hospital’s inter- and intra- campus transportation needs. 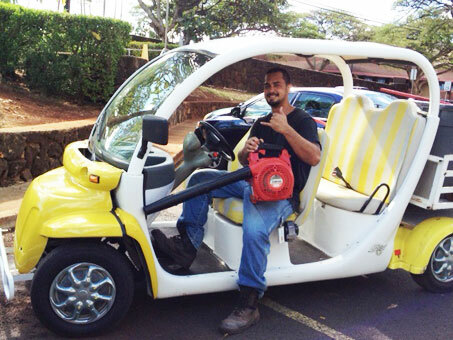 It took the Leahi Hospital Maintenance Department less than an hour to understand and appreciate the benefits of having a donated Global Electric Motor vehicle added to its existing fleet of vehicles. Leahi Hospital will use the GEM vehicle on a daily basis to help promote its sustainability efforts. The vehicle is highly visible with its bright yellow color and white trim. The GEM is a five horsepower, four-passenger vehicle with a top speed of about 25 miles per hour. It meets both National Highway Safety Administration and Hawaii traffic safety standards for use on private property and public roads.